Cold Weather Tips For Dogs! Winter is Maxxamillion's favorite time of the year and when it snows, well, there is no getting him to come inside the house. But as pet parents we have to make sure we keep our pets safe through the brutal winter season. 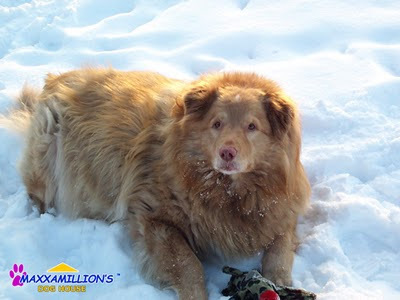 Make sure not to leave your pets outdoors for long periods of time, especially in sub-zero weather, which we're very prone to in the midwest. Short haired dogs are more susceptible to the cold weather than dogs with thick heavy fur. If you live in an area where salt is used on the sidewalks and streets, make sure to clean your dog's paws every time they are exposed to it. We use a small wet towel or baby wipes to clean Maxxamillion's paws. Maxxamillion always makes it into a game when we clean his paws with the towel by trying to play tug-of-war, and we of course cannot resist and always play his game. For more information and cold weather pet tips, Paw on this link!